Editor Charles H. Smith's Note: At the time of publication of this short monographic work, Ms. Cooke was a Scientific Aid at the Bureau of Biological Survey, Division of Biological Investigations. Original pagination indicated within double brackets. Citation: United States Department of Agriculture, Circular No. 40 (1928). The European starling (Sturnus vulgaris: family Sturnidae) is now a thoroughly naturalized member of the North American avifauna. However unwelcome its presence may be to many, it is here to stay. Considerable apprehension has been felt at the rapidity of its spread in recent years in view of the disastrous effects that have often followed the introduction of a foreign species into the fauna of a country (10).1 In the United States such introductions are now prohibited by law (Lacey Act, May 25, 1900), and no foreign wild birds or animals can legally be brought into the country except under permit issued by the Secretary of Agriculture. The legal protection at first enjoyed by the starling under nongame-bird laws has been in some States specifically withdrawn. In its original habitat the starling breeds from northern Norway and from about 64° north latitude in Russia and western Siberia to the Mediterranean, except in Spain and Portugal. It migrates in winter as far as northern Africa and India. From this region it has been introduced into Australia, New Zealand, Tasmania, and South Africa, as well as North America, in all of which places it has increased rapidly. In North America the starling now occurs from the Atlantic coast to the Mississippi River, but within this range it is unevenly distributed, and in sections where it is permanently resident there are many localities where it is still unknown. It seems advisable to trace and record further its spread in this country and thus make the data generally available (3). An earlier publication of the department (2) traced the spread of the starling in North America to January, 1924, since which time the range of the bird has nearly doubled in extent. Because of the fact that the starling is constantly invading new territory and, as a consequence, is confused with birds long known, and is thus frequently misidentified, it seems desirable to present a general description of the bird in its various plumages. (Pl. 1.) The body of the starling is of about the same size as that of the male red-winged blackbird (Agelaius phoeniceus) but its tail is short. "A blackbird that looked as though it had lost its tail" is a description not infrequently given by persons seeking the identity of the bird seen for the first time. The adults are practically alike and in breeding plumage at a little distance look black; seen more closely, however, they show iridescent purple and green. The long, pointed bill is yellow during the breeding season. During the molt, which takes place after the breeding season and extends into the early fall, the bill darkens to almost black, and all the new feathers have light tips, giving the birds a speckled appearance. During the winter these light tips wear off, leaving the iridescent breeding plumage. The young are an almost uniform dark olive-brown. They molt at about the same time as the adults, and by the latter part of September young of the year can not with certainty be distinguished from adults. Instead of hopping like robins and most perching birds, they will be seen to walk. The flight of the starling is very characteristic, and once learned, is easily recognized. The birds are swift flyers, at times traveling as fast as 49 miles an hour (9) with rapid wing beats, and they can change direction instantly. Flocks are often observed to execute aerial evolutions with the unanimity and precision of a company of well-drilled soldiers. The birds will sail for considerable distances with wings set, a habit similar to that of the purple martin (Progne subis), but more direct and vigorous flight distinguishes the starlings. The starling's principal notes are a clear whistle and a rasping alarm or scolding note. It also has considerable ability as a mimic, and sometimes causes confusion in the recording of native birds by song. Its imitation of the wood pewee (Myiochanes virens) often causes the latter to be reported well north in spring while it is still in its winter home in the Tropics. [[p. 3]] The permanent establishment of the species in North America dates from April, 1890, when 80 birds were released in Central Park, New York City. In March of the following year 80 more were released, and from these 160 birds have come the many thousands that have spread to Nova Scotia, to the Mississippi River, to central Ontario, and to the Gulf of Mexico. The spread has not been steady and even, but quite irregular, so that even now there are extensive areas along the border of its range where the starling is unknown. A period of about 10 years was required for the species to become thoroughly established in the region about New York City, but after that the spread was rapid. At various times the birds have established new centers, usually about cities, from which they have colonized the surrounding country. The starling is a natural vagrant, and its vagrancy has to some extent obscured its migratory character. Migration is rather generally considered a regular movement between definite summer and winter homes, but the starling, even in its native habitat, does not seem to have a very definitely fixed winter home. Banding returns have shown (12, p. 186-202) that the birds that breed in Great Britain are largely sedentary or only locally migratory, and that in winter birds from Norway and central Europe are present in Great Britain, and that birds from both those regions winter in Spain and northern Africa (1, vol. 1, p. 252-257). In North America starlings have no inherited ranges. It seems quite certain, however, that they are developing migratory habits, though they do not settle in definite winter homes but wander about from place to place in the southern part of their range. In the northern part they are absent or much reduced in numbers during the winter, and large flocks can be seen flying south before cold weather sets in. At this season the numbers in the south receive considerable reinforcements, and wandering flocks are found well beyond the limits of the breeding range. The farthest to the southwest that starlings have yet been known to breed is eastern Tennessee and northeastern Georgia (in small numbers only), but for several years they have wintered in large flocks in central Tennessee, and for three successive winters have been found in increasing numbers in southern Louisiana. At a point in southwestern Ontario, where only a few pairs are known to breed, several thousand birds occupy a roost from early in September until the latter part of October, when they leave for the winter. Starlings apparently do not breed on the coastal plain south of Virginia, but during the winter large, roving flocks of the birds are common there. Immense flocks also roost in winter about Washington, D. C., and many of these doubtless come from the north. In fact, large flocks were present there in winter for several years before the species was found breeding. The migrations and wanderings are important factors in the extension of the breeding range. During their winter wanderings starlings find congenial surroundings, and some remain there to nest. In the majority of places, even well north, the first appearance of [[p. 4]] the starling has been during the winter or early in spring. In some localities they remain irregular or accidental visitants for several years following their first appearance; in others they may breed the first season and settle down as residents. During the fall and winter starlings often frequent roosts with blackbirds, cowbirds (Molothrus ater), and grackles (Quiscalus quiscula), and it has, therefore, been thought that they travel together and that this accounts for the southward spread of the starling. It has been shown, however, that, at most, this could have been only a small factor in their spread (14, p. 211-213). Since 1924 a number of starlings have been banded, and in time more definite information regarding the travels of this bird will be obtained through this method of study. A few returns have already been received, the majority from the region where the species has been longest established. These were banded as breeding birds or nonmigrating birds in winter, and were retaken at or near the place of banding. Birds banded at Columbus, Ohio, early in March and in roosts at Washington, D. C., in January, show more of a disposition to travel to new and more distant localities. The starling is very prolific, raising two and sometimes three broods of three to six young a year. Unlike many of our native species, it is not intolerant of its own kind as nesting neighbors and so can multiply rapidly in a restricted space. Increasing numbers necessitate constant reaching out for food and new nesting places. The fondness of the species for the vicinity of water seems to have influenced this spread. Albany, N. Y., on the Hudson River, and Greenfield, Mass., on the Connecticut River, were reached before localities inland in western Connecticut. The probable route to Philadelphia was via the Passaic, Raritan, and Millstone Rivers to the Delaware Valley, and western New York was reached through the Hudson and Mohawk River Valleys and the lake region. For six years following its successful introduction the starling was not known to breed outside the limits of Greater New York, though the numbers were steadily increasing. By 1900 it had spread only up the Hudson River to Ossining, N. Y., along the shore of Long Island Sound, to Norwalk, Conn., and inland to Plainfield, N. J. While the birds were still confined to this small area, further importations of starlings and their transportation from one State to another were prohibited by Federal law. By that time, however, they had gained a permanent foothold about Greater New York. The next six years saw the range extended to the Connecticut River and up its valley as far as Hartford; up the Hudson to Newburgh; and south and west as far as Princeton, N. J. An isolated pair had bred in 1904 at Trevose, Pa., and wandering flocks reached Philadelphia in 1905. By 1910 the birds had become well established around Philadelphia and were moving into the adjacent territory as they had spread around New York City 10 years before. At this time they were locally distributed over much of New Jersey south to Burlington and Vincentown, and specimens had been taken at Cape May. They had [[p. 5]] progressed up the Hudson Valley to Rhinebeck, where they bred that year, and up the Connecticut Valley to Amherst, Mass. Along the Sound shore they had reached eastern Connecticut, and one or two pairs had been found breeding in the vicinity of Providence, R. I. The year 1916 saw the occupied territory extended well beyond its previous limits. The range then included the Connecticut Valley to Woodstock, Vt., the southern border of New Hampshire, and the southern corner of Maine, to and including Portland. The main extension, however, was westward. From Albany, N. Y., which had been reached in 1911, the birds had worked westward along the Mohawk Valley to the lake region of central New York, and in 1916 were found breeding in several localities as far west as Ithaca. Wayne County, Pa., was reached, and birds were reported as far west of Center County. A pair or two bred in the District of Columbia, the first breeding record for that locality, though individuals had appeared in January, 1912, and flocks had been present every winter thereafter. A specimen taken at West Lafayette, Ohio, in January, 1916, marked the first crossing of the Allegheny Mountains. Again in 1922 there was a marked extension of the range, when the limits included Waterville and Burnham, Me., Concord, N. H., the Connecticut Valley as far as St. Johnsbury, Vt., all of New York State except the mountains and the extreme northern part, and Pennsylvania, Maryland, and Virginia, locally. 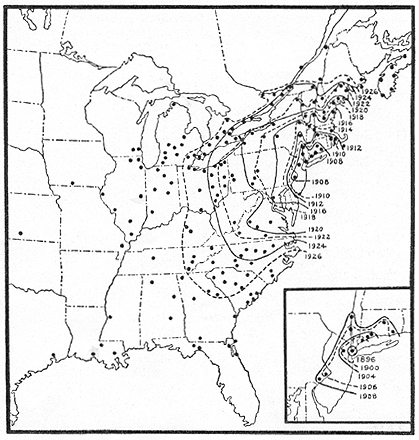 In 1921 starlings had bred in at least four localities in Ohio, and in West Virginia. Spartanburg and St. Matthews, S. C., are localities where single pairs bred in 1922, far south of the general breeding range. By 1927 starlings were breeding across southern Michigan, in at least four localities in Indiana, and in eastern Kentucky (Lexington), in eastern Tennessee (Bristol, Knoxville, and Athens), in northeastern Georgia (Athens), and in upper South Carolina. The Canadian border was crossed in July, 1919, when a few starlings were observed near Brockville, Ontario. In the spring of 1922 individuals reached Ottawa, but none bred there until 1925. In 1922 they bred at Burlington at the west end of Lake Ontario. The next year they bred at Port Dover, on Lake Erie, and crossed the line into Quebec, breeding at Hatley, 20 miles north of the international boundary, and at Montreal. By 1927 they were breeding locally over southern Quebec and Ontario, and several pairs nested that spring at North Bay on Lake Nipissing. Starlings, individuals or small flocks, have been recorded far beyond what can be considered their breeding range. Eight specimens have been taken in Nova Scotia, all but one in winter, probably driven there by storms. They appeared in Quebec City in 1927, and that year bred nearly a hundred miles farther down the St. Lawrence River at Kamouraska. To the south and west the records show the greatest reaching out of the species, as would be expected. In November, 1917, a specimen was collected at Savannah, Ga., and in January, 1918, birds were taken at Amelia Island, Fla., and Montgomery, Ala. At Savannah a small flock was present in the winter of 1922-23, but no more have been seen to date (January, 1928). In Alabama a large flock was seen near Montgomery on January 4, 1920, one was taken at Leighton in October, 1926, and one was found dead at Anniston in January, 1928. In Florida the recent records [[p. 6]] are as follows: Four at Lake Jackson, Leon County, November 9, 1924; a few at Jacksonville and St. Augustine in January and March, 1925; and a flock of four at Wakulla Beach, January 26, 1926. This completes the records for the South Atlantic States. The only record for Mississippi is of a flock of about 50 seen November 24, 1925, at Vicksburg. The first record for Louisiana was of a small flock seen several times in December, 1921, near the Mississippi River about 25 miles above Baton Rouge. In January, 1926, a single specimen was taken near New Orleans, and small flocks have been seen near the Gulf during the winters of 1926-27 and 1927-28. Since 1923 starlings have been noted in a number of localities in Indiana and in 1927 were known to breed in at least four localities in the northern half of the State. The first report for Illinois was of a flock of seven or eight seen several times in a roost with cowbirds and grackles at Urbana during January and February, 1922. A pair bred at Texico in 1924, and since December, 1925, birds have been seen several times in winter in the Chicago region. In December, 1927, a flock of about 40 was noted at Marion in the southern part of the State, and specimens have been taken at Quincy and Godfrey on the Mississippi River. Starlings reached Detroit and Ann Arbor, Mich., in 1924, and by 1927 they were breeding across the southern part of the State and had occurred locally north to Saginaw Bay, and a few near the Straits of Mackinac. Two specimens were taken near Milwaukee, Wis., in February and March, 1923, and a pair raised two broods near Waukesha in 1926. The farthest outlying records are of isolated birds. One was taken at Lamoni, Iowa, in December, 1922; one was found dead at Cove, Tex., in December, 1925; and two were seen at Clearwater, Kans., in February, 1927. A specimen was taken at Charleston, Mo., on January 28, 1928, that had been banded at Columbus, Ohio, in March of the previous year. A bird was found dead at Thessalon, western Ontario, in February, 1927. The present range of occurrence of the starling in North America may be considered to extend from central Maine to the Mississippi River and from southern Canada and central Michigan to the Gulf of Mexico; but in much of this territory its occurrence is still only local or accidental. In the northern part of this range it is largely a summer resident only, and in the southern part it occurs only in winter. Probably the breeding range of 1920 as indicated on the accompanying map (fig. 1) would include all the territory where the starling is sufficiently abundant to be of economic importance, and even within this area there are many localities where the bird is still unknown. From southern New England to eastern Pennsylvania and northern Virginia the starling is very abundant. From southern New England to central New Jersey it now decidedly outnumbers the house sparrow (Passer domesticus), which has somewhat decreased in recent years. In the cities of this region the starling is without [[p. 7]] question the most abundant breeding bird; in suburban areas it finds a rival in the robin (Planesticus migratorius), which there it outnumbers, but in the rural districts the robin is the more abundant. On Long Island the robin is considered as outnumbering the starling two to one. In this region the starling is present throughout the year but is much less abundant in winter, and in case of severe cold or snow it may disappear entirely until a thaw comes. Fig. 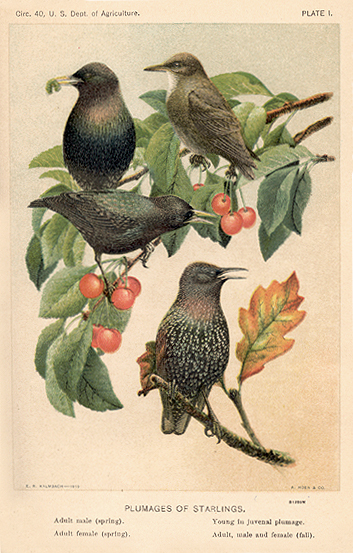 1.--Breeding range of the European starling in eastern North America. Areas successively covered in two-year periods shown by alternating broken and continuous lines. Spots outside the 1926 line indicate isolated records, mainly in winter, details of which are given in the text. The breeding range of the starling in Europe seems nearly to coincide with conditions approximating the Transition and Upper Austral Zones in eastern North America. At the present time practically all breeding records in this country fall within these two zones, with winter occurrences extending into the Lower Austral Zone, as in corresponding situations in the Old World. It is interesting to note that while the presence of water had a marked influence on the spread of the species in the North, the extensions southward have been in the higher land rather than along the [[p. 8]] coastal plain. All records thus far received from the coastal plain south of Virginia have been of birds seen in winter. Starlings prefer a well-settled agricultural region, so that it seems doubtful whether they will extend their breeding range much farther northward into the wooded country. To the east, parts of the Maritime Provinces will doubtless be occupied in time. Southward the climatic conditions may check the further advance of the bird as a breeding species, but it may be looked for there in increasing abundance in winter. The area of the Great Plains, with its scarcity of suitable nesting sites, will undoubtedly retard the westward advance; whether or not it will prove a complete barrier can not now be foreseen. If the Plains are passed, the Rocky Mountains will present another barrier, but if both are passed the species may be expected to extend its range to the Pacific. The growing abundance of the starling has caused anxiety, and its activities have resulted in many complaints. The Bureau of Biological Survey began studying the problem in 1910 (13, p. 10-11), and part of the results were published by Forbush in 1915 (3). Since 1916 the bureau has carried on extensive investigations to ascertain the economic status of the starling in the United States and has published comprehensive reports of its findings (4, 5). These investigations, and studies of the bird in Canada (7), have shown that in this country the species has not yet developed the destructive food habits that characterize it in parts of Europe and Australia and that, judged by food habits only, it is not a bad citizen. Its undesirability arises chiefly from its choice of nesting sites, its relations with native birds, and its habit of gathering in large flocks. Starlings nest in holes in trees, in bird boxes, and in available crevices about buildings, and the filth from their nests makes them rather undesirable. In availing themselves of bird boxes, they come into competition with other birds for nesting sites. Naturally pugnacious in disposition, the starling drives other birds away from the vicinity of houses, especially such species as the bluebird (Sialia sialis) and the flicker (Colaptes auratus), which nest in holes or boxes provided for their use. Experiments have shown, however, that the starling can not enter a hole less than 1 ½ inches in diameter, so that it is possible to protect some of the native birds by providing boxes with holes large enough for them but too small for the starling (6). Whether or not the starling will cause any decrease in the total number of native birds is as yet an open question, but it will probably drive some away from the vicinity of houses. Partiality for our native birds naturally causes antagonism to the starling, even though the food habits of the newcomer may be better than those of the native birds it supplants. The greatest danger from the starling seems to be from its habit of gathering in large flocks. A few individuals may be harmless or even beneficial, but the immense flocks of starlings that gather after the breeding season may cause harm through overconcentration in crop areas or from their insanitary habits. [[p. 9]] After many failures the European starling was successfully introduced into this country in 1890 at New York City, where it became firmly established within a few years (about 1896), and now it must be considered a naturalized member of the North American avifauna. Within 20 years of its establishment it had become one of the most abundant birds in the region about New York City and of local occurrence from Maine to Maryland. In another dozen years it had occurred in every State from the Atlantic to the Mississippi and from the Ottawa and St. Lawrence Rivers, Canada, to the Gulf of Mexico, with outlying records in Nova Scotia, Iowa, Missouri, Kansas, and Texas. (1) CLARKE, W. E. 1912. STUDIES IN BIRD MIGRATION. 2 v., illus. London and Edinburgh. (2) COOKE, M. T. 1925. SPREAD OF THE EUROPEAN STARLING IN NORTH AMERICA. U. S. Dept. Agr. Circ. 336, 8 p., illus. (3) FORBUSH, E. H. 1915. THE STARLING. Mass. State Bd. Agr. Circ. 45, 23 p., illus. (4) KALMBACH, E. R. 1928. THE EUROPEAN STARLING IN THE UNITED STATES. U. S. Dept. Agr., Farmers' Bul. 1571, 27 p., illus. (5) _____ and GABRIELSON, I. N. 1921. ECONOMIC VALUE OF THE STARLING IN THE UNITED STATES. U. S. Dept. Agr. Bul. 868, 66 p., illus. (6) _____ and McATEE, W. L. 1925. HOMES FOR BIRDS. U. S. Dept. Agr., Farmers' Bul. 1456, 22 p., illus. (7) LEWIS, H. F. 1927. A DISTRIBUTIONAL AND ECONOMIC STUDY OF THE EUROPEAN STARLING IN ONTARIO. Univ. Toronto Studies, Biol. Ser. 30, 57 p., illus. (8) LORD, W. R. 1902. A FIRST BOOK UPON THE BIRDS OF OREGON AND WASHINGTON. 304 p., illus. Portland, Oreg. (9) MEINERTZHAGEN, R. 1921. SOME PRELIMINARY REMARKS ON THE VELOCITY OF MIGRATORY FLIGHT AMONG BIRDS, WITH SPECIAL REFERENCE TO THE PALÆARCTIC REGION. Ibis (11) 3: 228-238. (10) PALMER, T. S. 1899. THE DANGER OF INTRODUCING NOXIOUS ANIMALS AND BIRDS. U. S. Dept. Agr. Yearbook 1898: 87-110, illus. (11) PHILLIPS, J. C. 1928. WILD BIRDS INTRODUCED OR TRANSPLANTED IN NORTH AMERICA. U. S. Dept. Agr. Tech. Bul. 61, 64 p.
(13) UNITED STATES DEPARTMENT OF AGRICULTURE. 1910. REPORT OF THE CHIEF OF THE BUREAU OF BIOLOGICAL SURVEY [FOR 1910]. U. S. Dept. Agr. Ann. Rpt. 1910: 549-565. (14) WETMORE, A. 1926. THE MIGRATIONS OF BIRDS. 217 p., illus. Cambridge, Harvard University Press.